It may not be able to take a hockey puck to the face, but for scaring campers, it’s second to none. For more than a generation, Friday the 13th has been tops among the all-time horror franchises, and Jason Vorhees is a character as recognizable as any Dracula, Frankensteins or Mummies you might want to throw out there. And a big part of what’s made Jason such a household name has always been the mask. For NECA‘s new version of Jason‘s signature accessory, we cast it directly from one used in Freddy vs. Jason, to bring you as close to the real thing as humanly possible (at least without making you spend thousands of dollars). Click the picture on the right and see if you don’t agree that the detail is just amazing. 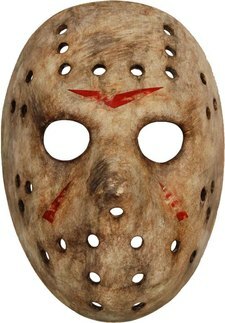 The mask comes in a blister pack and has harness straps so you can either be sure it’s going to stay on your face while you reenact one of the century’s most epic horror battles, or won’t fall off your wall when you’re jumping up and down in excitement over the next Friday the 13th marathon. It’s a genuine piece of horror history, and for any Jason buff, well, you don’t need me to tell you how much you need it. Our Freddy vs. Jason Jason Mask figures hits stores this month and will be featured on our Amazon storefront . Keep it tuned to necaonline.com for more info on Friday the 13th and much more from your favorite games and movies.